These stages are often referred to collectively as the software development life-cycle, or SDLC. 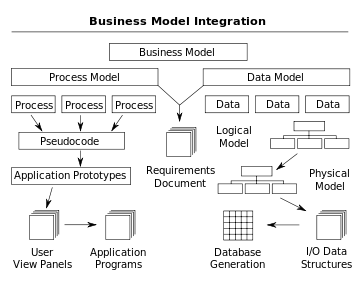 Different approaches to software development may carry out these stages in different orders, or devote more or less time to different stages. The level of detail of the documentation produced at each stage of software development may also vary. These stages may also be carried out in turn (a “waterfall” based approach), or they may be repeated over various cycles or iterations (a more "extreme" approach). The more extreme approach usually involves less time spent on planning and documentation, and more time spent on coding and development of automated tests. More “extreme” approaches also promote continuous testing throughout the development life-cycle, as well as having a working (or bug-free) product at all times. More structured or “waterfall” based approaches attempt to assess the majority of risks and develop a detailed plan for the software before implementation (coding) begins, and avoid significant design changes and re-coding in later stages of the software development life-cycle planning. The sources of ideas for software products are plentiful. These ideas can come from market research including the demographics of potential new customers, existing customers, sales prospects who rejected the product, other internal software development staff, or a creative third party. Ideas for software products are usually first evaluated by marketing personnel for economic feasibility, for fit with existing channels distribution, for possible effects on existing product lines, required features, and for fit with the company's marketing objectives. In a marketing evaluation phase, the cost and time assumptions become evaluated. A decision is reached early in the first phase as to whether, based on the more detailed information generated by the marketing and development staff, the project should be pursued further. In the book "Great Software Debates", Alan M. Davis states in the chapter "Requirements", sub-chapter "The Missing Piece of Software Development"
Once the requirements are established, the design of the software can be established in a software design document. This involves a preliminary or high-level design of the main modules with an overall picture (such as a block diagram) of how the parts fit together. The language, operating system, and hardware components should all be known at this time. Then a detailed or low-level design is created, perhaps with prototyping as proof-of-concept or to firm up requirements. An engineering approach to software development and maintenance. Open Source documentations, via libraries such as GitHub, provide free code for software developers to re-use and implement into new applications or designs. ^ "Application Development (AppDev) Defined and Explained". Bestpricecomputers.co.uk. 2007-08-13. Retrieved 2012-08-05. ^ DRM Associates (2002). "New Product Development Glossary". Retrieved 2006-10-29. ^ Otero, Carlos. "Software Design Challenges". IT Performance Improvement. Taylor & Francis LLC. Retrieved 19 October 2017. ^ Edward J. Barkmeyer ea (2003). Concepts for Automating Systems Integration NIST 2003. ^ a b c d Paul R. Smith & Richard Sarfaty (1993). Creating a strategic plan for configuration management using Computer Aided Software Engineering (CASE) tools. Paper For 1993 National DOE/Contractors and Facilities CAD/CAE User's Group. ^ Kuhn, D.L (1989). "Selecting and effectively using a computer-aided software engineering tool". Annual Westinghouse computer symposium; 6-7 Nov 1989; Pittsburgh, PA (USA); DOE Project. ^ P. Loucopoulos and V. Karakostas (1995). System Requirements Engineering. McGraw-Hill. ^ CASE Archived 2012-02-18 at the Wayback Machine definition In: Telecom Glossary 2000 Archived 2005-11-22 at the Wayback Machine. Retrieved 26 Oct 2008. ^ K. Robinson (1992). Putting the Software Engineering into CASE. New York : John Wiley and Sons Inc.
^ Xiao He (2007). "A metamodel for the notation of graphical modeling languages". In: Computer Software and Applications Conference, 2007. COMPSAC 2007 – Vol. 1. 31st Annual International, Volume 1, Issue, 24–27 July 2007, pp 219-224. ^ Merx, Georges G.; Norman, Ronald J. (2006). Unified Software Engineering with Java. Prentice-Hall, Inc. p. 201. ISBN 0130473766. Wikimedia Commons has media related to Software development. Kit, Edward (1992). Software Testing in The Real World. Addison-Wesley Professional. ISBN 0201877562. McCarthy, Jim (1995). Dynamics of Software Development. Microsoft Press. ISBN 1556158238. Conde, Dan (2002). Software Product Management: Managing Software Development from Idea to Product to Marketing to Sales. Aspatore Books. ISBN 1587622025. Davis, A. M. (2005). Just enough requirements management: Where software development meets marketing. Dorset House Publishing Company, Incorporated. ISBN 0932633641. Hasted, Edward (2005). Software That Sells: A Practical Guide to Developing and Marketing Your Software Project. Wiley Publishing. ISBN 0764597833. Hohmann, Luke (2003). Beyond Software Architecture: Creating and Sustaining Winning Solutions. Addison-Wesley Professional. ISBN 0201775948. Rittinghouse, John (2003). Managing Software Deliverables: A Software Development Management Methodology. Digital Press. ISBN 155558313X. Wiegers, Karl E. (2005). More About Software Requirements: Thorny Issues and Practical Advice. Microsoft Press. ISBN 0735622671. Wysocki, Robert K. (2006). Effective Software Project Management. Wiley. ISBN 0764596365.